How Should Jews View Christianity? Yesterday, an interesting confluence of events got me thinking. I was guiding some tourists (a really nice Jewish family from New Jersey) who wanted to see Caesarea and Zichron Yaakov. Of course, yesterday was also the day that Pope Francis visited Jerusalem. Since we left the city at 9:30 in the morning when the pope was on the other side of town, the effect of his visit on our day was limited to some minor traffic issues. Nevertheless, as I say, the juxtaposition got me thinking. While standing in the Roman Hippodrome in Caesarea, I told my guests about a historical event that happened in that city. The incident undoubtedly attracted almost no attention at the time (especially because it may have been kept secret), but it began a chain of events that changed the history of the world, including some very severe consequences for the Jewish People. The event took place sometime in the middle of the first century of the Common Era, and is known to us only from Christian sources. Although the early Christians were Jews who observed all of the commandments of the Torah (the only thing differentiating them from other Jews being their belief that the Messiah had already come), after a few decades they made the decision to turn their attention to Gentiles. And according to Christian tradition, the very first Gentile to be baptized was a man named Cornelius the Centurion – a Roman military officer stationed in Caesarea. He was followed by many others; although Christian belief never really caught on among Jews, it spread like wildfire among Gentiles. What began with Cornelius in Caesarea ended up conquering the Roman Empire within a few centuries. After that we walked a few hundred feet over to the walls of the Crusader city of Caesarea, and spoke about what happened over a thousand years later, when European Christians – the spiritual descendants of Cornelius – returned to the Land of Israel as conquerors. Those Crusaders massacred thousands of Jews, both in Europe along the way, and here in Israel. As we spoke of that, I mentioned the dramatic contrast with the events taking place at that very moment back in Jerusalem – the leader of the largest Christian denomination visiting the sovereign capital of the Jewish State of Israel, recognizing and honoring that sovereignty, expressing horror and remorse for the sins of the Holocaust, and publicly declaring the fundamental theological change that Christianity has undergone in the past few decades (and which this pope has emphatically embraced). Certainly, this confluence should be viewed as the closing of a historic circle. 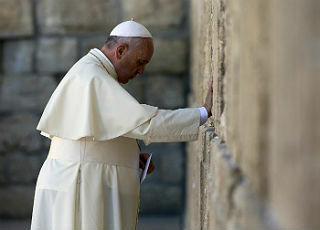 The Catholic church, which was the source of some of the worst acts of anti-Semitism in history, today acknowledges the unique historic role of the Jewish People and our covenant with God. So where does that leave us? How should Jews view Christians and Christianity? The answer, I believe, is complex. On the one hand, even after the historic reconciliation, we must recall that Christian belief still contains a number of fundamentally idolatrous concepts  that stand in direct opposition to the Torah. On the other hand, we should remember that in a celebrated passage, the Rambam notes that both Christianity and Islam, while containing many false beliefs, are part of God’s plan to bring the messages of Torah to the entirety of humanity, helping to pave the way for the coming of the Messiah. So that means that Christianity represents a number of major steps on the road from the falsehoods of the ancient past towards the world of truth foreseen by the prophets. Not all bad; not all good – somewhere in the middle. The other day, someone asked me how I would react if I was one of the people who met the pope personally, and he gave me a blessing. Would I respond “Amen”? Would I feel blessed? I responded that if he blessed me using the specific name of Jesus, I would certainly not say “Amen”. But if it was a generic blessing in the name of God, from a person who represents this major step towards true worship of the true God (even if they aren’t completely there yet), I would in fact appreciate it. In any case, standing in Caesarea talking about Cornelius and the Crusaders while the leader of over 1 billion Christians was praying to God at the Western Wall was, for me, just another indication of the approaching Redemption. The exact halachic status of Christian worship is a subject of debate from the time of the Rishonim (early commentators) through contemporary authorities. Nevertheless, it is generally recognized that certain beliefs – chief among them the concepts of the trinity and incarnation – are in basic conflict with Jewish theology. The passage in question is found in the Mishneh Torah, at the end of chapter 11 in the Laws of Kings (otherwise known as Hilchot Melachim. Shout-out to a few MMY girls who know who you are. Message me if you see this!). Because the passage contains some criticism of the founder of Christianity, it was censored from the early printed texts on which many contemporary printings are based. Therefore, if you try to look it up, you may not find it in the edition you are using. It can be seen, however, in newer editions of the Rambam, or online here. This entry was posted in Uncategorized on May 27, 2014 by rabbihaber. Israel at 66 – What are You Doing? It’s that time of year again. 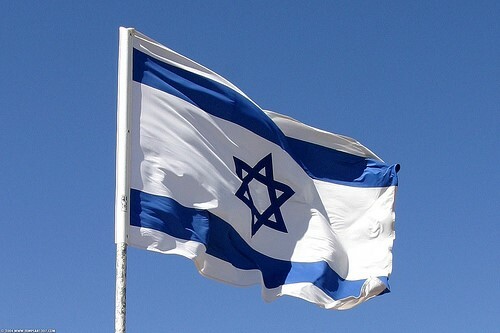 Here in Israel, blue and white flags are going up on lampposts, apartment balconies, public buildings and automobiles, and people are stocking up on meat and charcoal. In Jewish communities abroad as well, celebrations for Israel’s 66th Independence Day are scheduled and the Jewish People is getting ready to celebrate. Well, at least many of us are. There are still, as there have been from the beginning, some Jews who don’t think we should celebrate. Among these are some liberal Jews who feel that Israel isn’t democratic enough, and some religious Jews who think Israel isn’t Jewish enough. Some of these people will be demonstratively boycotting or protesting celebrations, and many others will just stay home. To me, though, there is no question whatsoever; the requirement to celebrate is 100% clear. Every day when I walk down the street all I see is the fulfillment – in exquisite detail – of Biblical prophecies. While I recognize that there have been great Torah leaders who saw things differently, with each passing year it becomes clearer and clearer that God’s will was different than we may have thought. Generations ago there were indeed legitimate arguments about how the redemption of the Jewish People was to be brought about. But as Rabbi Berel Wein declares in this remarkable piece, by now history has spoken. I’ve written about this a number of times in the past. I’ve analyzed the connection of the State of Israel to the coming of the Messiah from a philosophical angle and from a halachic one. I’ve written emotionally about these things as well, and spoke about it in this YouTube video made by my neighbor Izzy Broker. In countless speeches I’ve given over the years for Yom HaAtzmaut, I’ve spoken passionately about our absolute obligation to sing and dance (and perhaps make mangals*), and to offer special prayers of thanksgiving for the great miracles we continue to experience on a daily basis. This year, I won’t elaborate on those points (you can just click on the links above) but instead go a step further and talk about the purpose of celebrating. Yom HaAtzmaut isn’t just an excuse to party, and it isn’t even only about expressing gratitude to the Almighty. Both of those things are important, but if that’s all we do, we’re missing the point. The singing, dancing, celebrations and prayers are meant to move us and motivate us to action. The Biblical prophets promised us that we’d survive the harsh exile come back to the land of Israel. But they also told us that each one of us needs to be deserving in order to participate. For example, take a look at Yechezkel (Ezekiel) 20:33-44. This prophecy (especially verse 38) makes clear that the redemption of the Jewish people is assured on the national level, but that each individual still needs to be worthy of participating. We are not redeemed passively; each one of us has to be worthy of redemption. For Jews still living abroad, think about making Aliya. For many people, it may very well not be practical or advisable at the moment, and that is completely legitimate. But it doesn’t exempt you from thinking and planning. If you can’t make Aliya today, when and how can it become possible? What are you doing to make it a reality? For those already living in Israel: What are you doing PERSONALLY to help make this country better, stronger, more developed? What else can you contribute, beyond what you are doing already? For Jews everywhere: What can you do to help bring Jews back to Judaism and back to Israel, to support Israel and help defend her, and to contribute to strengthening the Jewish people and its eternal message? And finally: what can each of us do to improve ourselves personally and to improve our relationship with our creator? What can we do to make sure we are worthy of participating in the redemption, as it occurs here and now? Chag Atzmaut Samaeach to everyone! *Mangal is Israeli slang for “barbecue”. According to Wikipedia, the source of this word is in the Bedouin dialect of Arabic, from which it was transferred in a modified form to Turkish and from there to Israeli Hebrew. Who knew?? This entry was posted in Uncategorized on May 4, 2014 by rabbihaber.